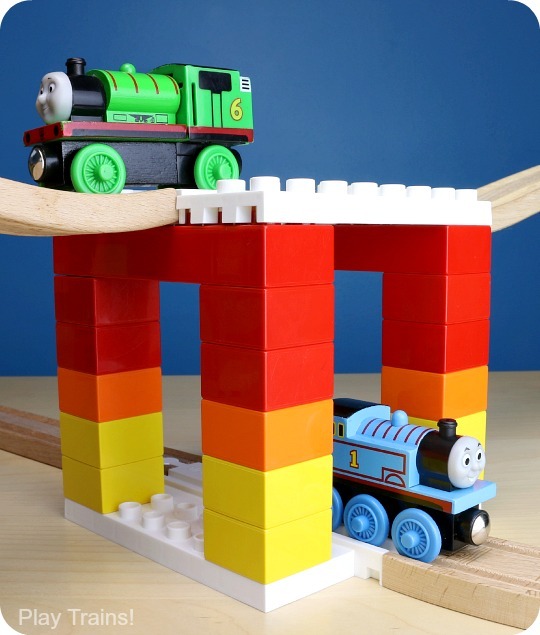 I’ll bet most families who own both wooden train tracks and DUPLO blocks have thought, “If only there were a way we could combine these!” I know we did, and we’ve tried a few methods of doing it, but none of them worked particularly well. 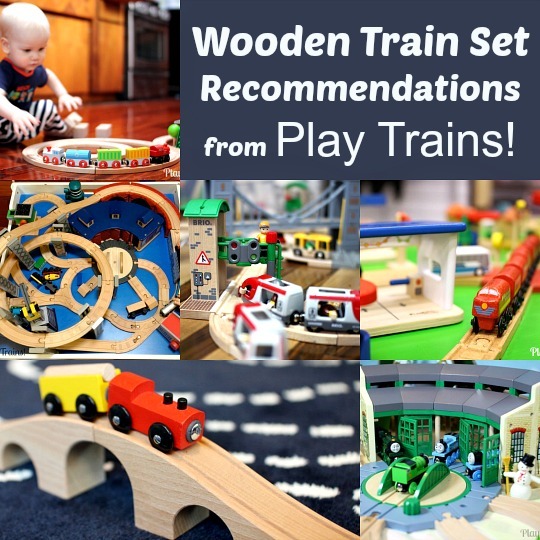 That’s why I was excited when Dreamup Toys emailed me, asking if they could send us some of their Wooden Railway Block Platforms to try out. 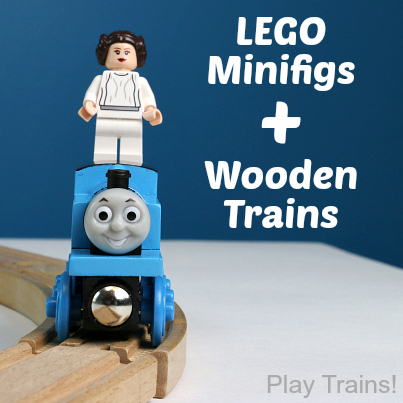 I was even more excited to see how inspired my son was to build with his DUPLO and wooden train tracks once he got his hands on the platforms! As soon as we got the platforms up into our train room (i.e. 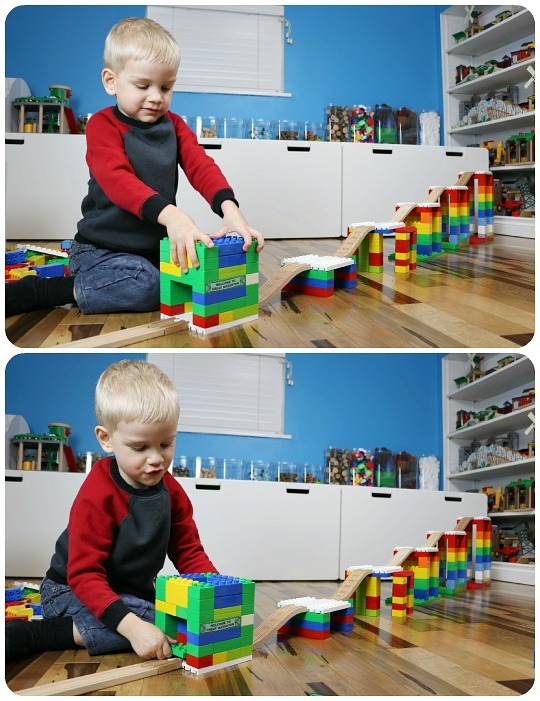 the other end of my office), he started experimenting with the platforms, tracks, and DUPLO blocks, figuring out how to raise a platform, how tall the different platforms needed to be in comparison to each other, and so on. 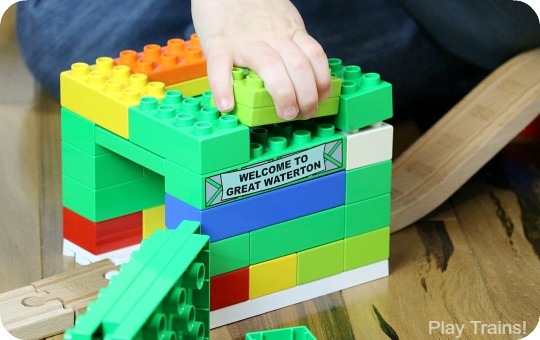 Meanwhile, I built the tallest three platforms, and then we connected our creations up to each other, working together to figure out what adjustments we needed to make to get our designs to work together. Next, the Little Engineer started building what I thought was a normal tunnel on another platform at the bottom of the slope. It turned out that it was a Train Smasher (or Train Crusher, depending on when you asked him what it was), with the roof of the tunnel attached to a thick center column that he could push down and “smash” anything in the tunnel. Then the roof could be lifted back up and pressed into place from underneath. He was extremely proud of this creation, and it was so fun to see him continue to work on it and improve it! He made the column taller, so that it still stuck out after it was smashed down. That made it much easier for him to reset the smasher afterwards. We did have a talk about what might happen to the paintwork on his wooden trains if he really smashed them with the Train Smasher. I suggested that he have Thomas pull a freight car full of craft pom poms, so that Thomas could make it through okay while his freight car got smashed. The Little Engineer thought that was a great idea, so Thomas’ paintwork was saved. 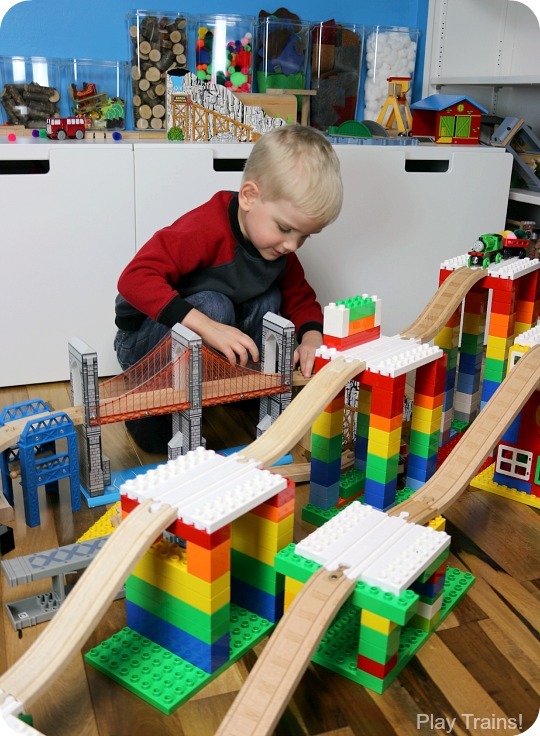 After he finished work on the Train Smasher, he built some falling towers of rock on another platform. After that, I left the room for a while to take a phone call. 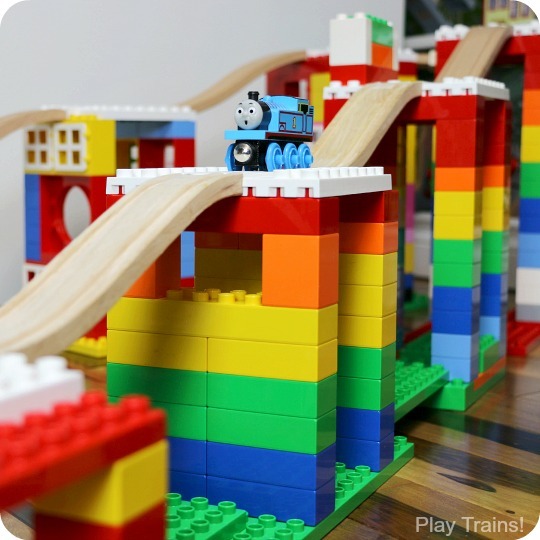 When I came back, the Little Engineer had built train tracks and bridges and platforms all over the room! 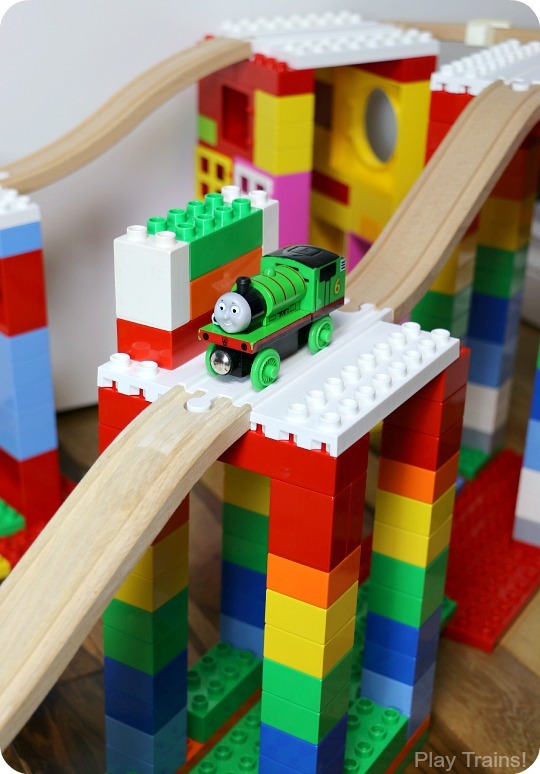 He’s been more into pretend play than building this fall, and before that he was very into building LEGO sets, so this level of excitement about his wooden trains and his old DUPLO blocks is amazing to me. The layout is still continuing to evolve days later. 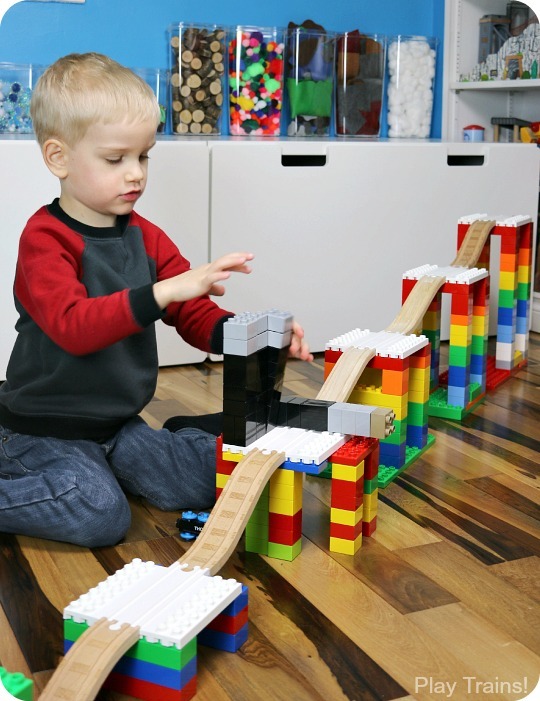 Together, we made this cool pair of long slopes, connected at the top in a V-shape by a sharp curve (we used three short curved tracks connected with Suretrack wooden train track clips to hold them together without supports underneath). 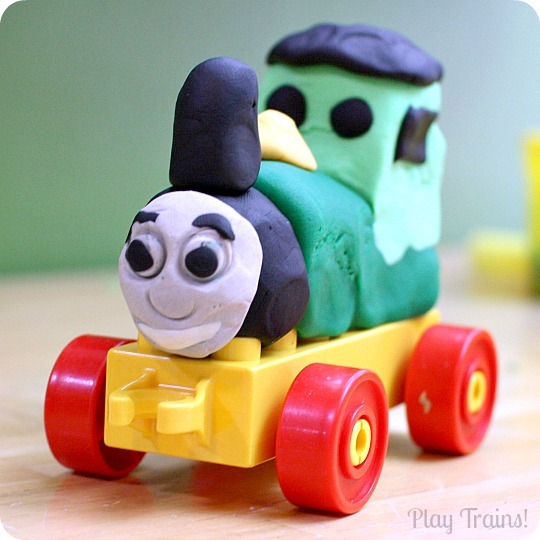 He had fun racing Thomas and Percy down the two hills. Since that day, we’ve come up with even more fun things to do with these platforms, and I think it will be a long time before either one of us runs out of inspiration! 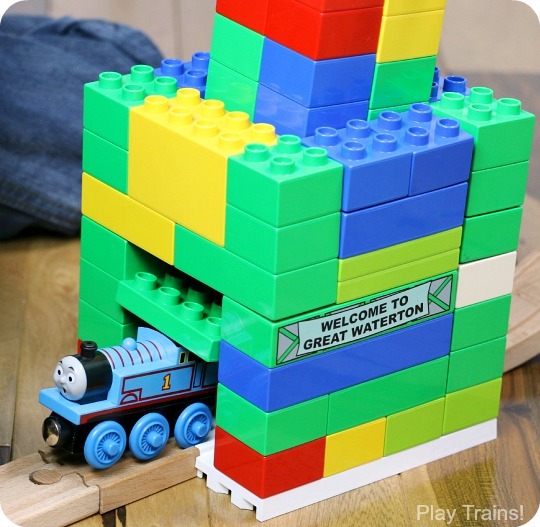 As well as a wonderful way to encourage creative building play in younger kids, this is such a great way to make both wooden trains and DUPLO blocks new again for kids who are on the older end of the wooden train age range. 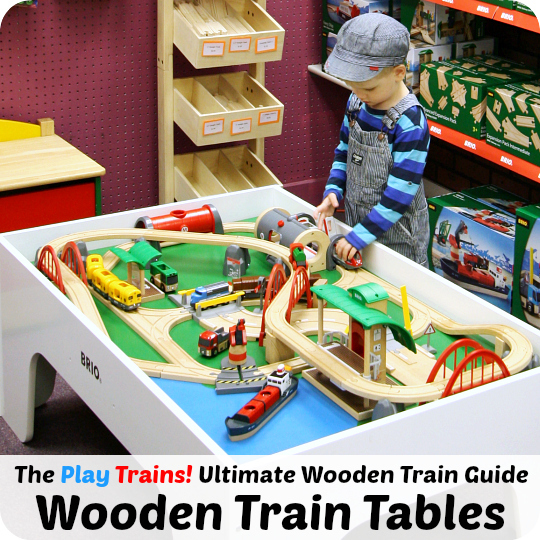 If you want to learn more about Dreamup Toys Wooden Railway Block Platforms, or just learn some tips and tricks for how to use them once they get to your house, read our informational post about building with the platforms. 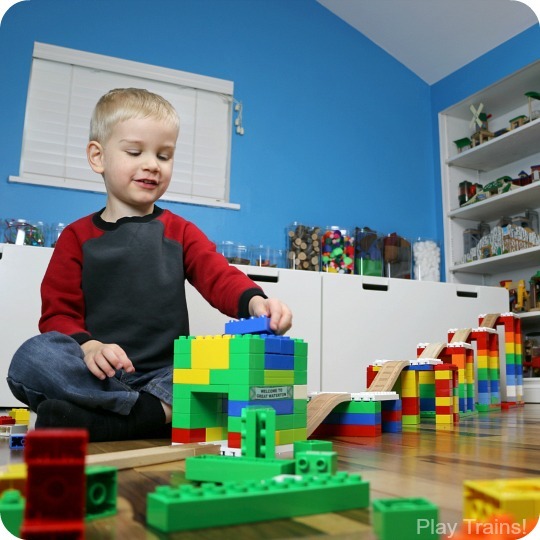 There’s a ton of information and lots of photos to illustrate everything I learned from playing with them this week, plus recommendations for DUPLO sets to combine with the platforms. 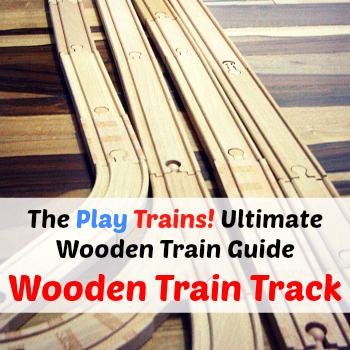 do those tracks wooden tracks work with hot wheels cars, too? I’ll check! 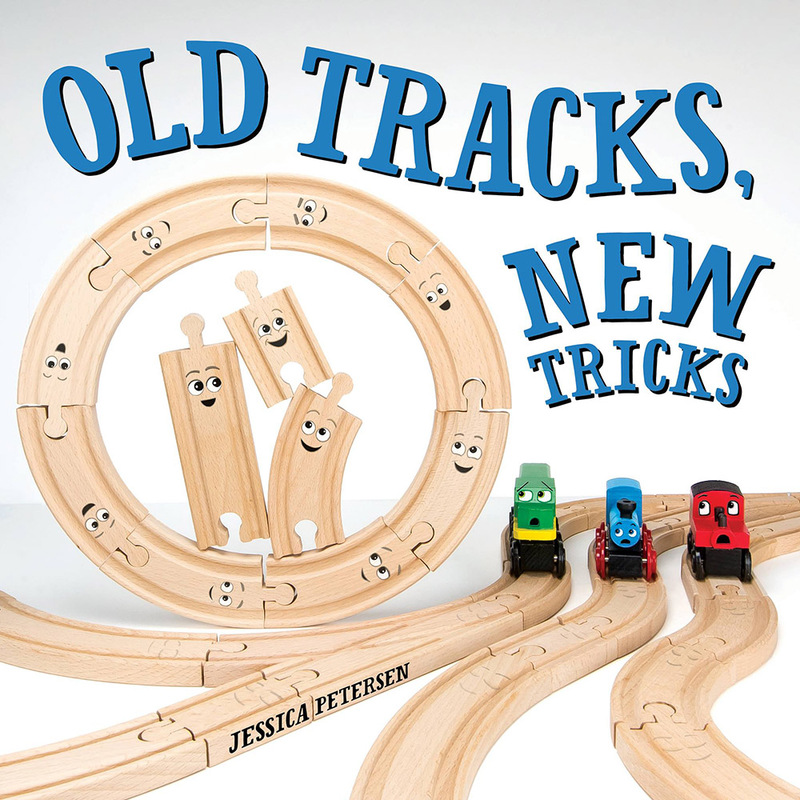 I think they’ll work about as well as they do with regular wooden track, i.e. the wheels are the right width for the tracks, but the car bodies ride too low and kind of scrape along on them. I love all the ideas u have given me!!!! I can’t believe I only now discovered your blog! It’s genius! 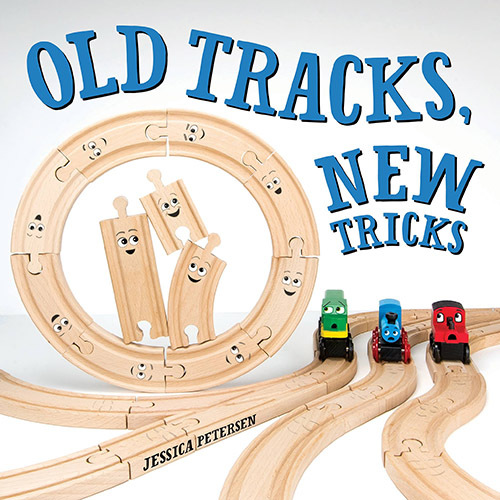 I know a few people who have been playing cars and trains for years now. They MUST come and visit! And this product, wow, I can’t wait to show my children, it’s genius! This post is fabulous. 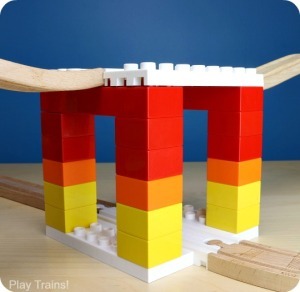 We were trying to figure out a way to make a reversible table for trains and Legos, and this puts them both together PLUS extra math/engineering/science tie-ins! I absolutely LOVE this! Thank you for the great ideas and photos! Oh great! 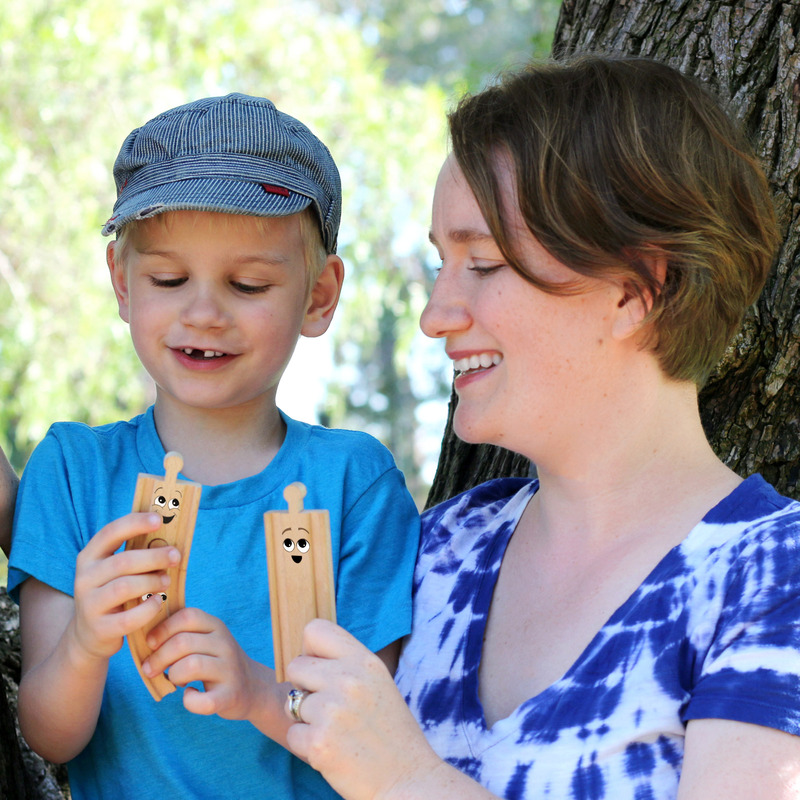 I hope you enjoy them as much as we do!